It's systematic, hydromatic, ultramatic ... why it could be a John Travolta Name Generator! That's right, the solution to the question, "How would John Travolta pronounce my name?" has been provided courtesy of Slate. This viral sensation was hatched after Travolta, 60, butchered Broadway legend Idina Menzel's name at the 2014 Oscars on Sunday, March 2, calling her "Adele Dazeem." The site created the generator to show readers what their names "Travoltafied" might be. More often than not, it tends to turn female names into male names and occasionally add in some strange letters. And though Facebook and Twitter are ablaze with fans posting their results, few A-Listers have tried out the fun trick -- or shared it via social media, at least. So Us Weekly decided to try out the generator with a few of Hollywood's elite. 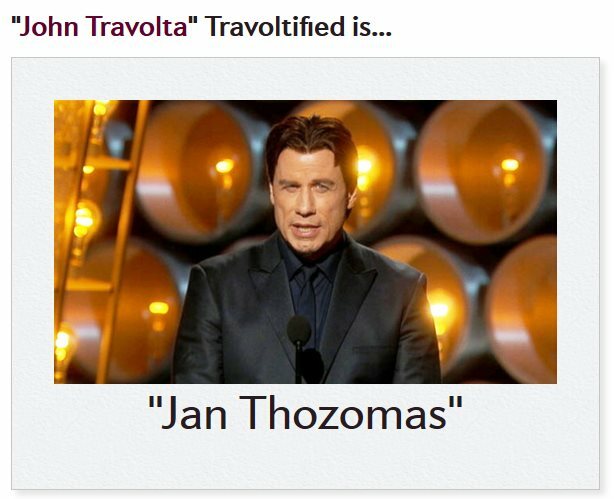 First and foremost, Travolta himself would be "Jan Thozomas." Look who's talking! Two days after his now-infamous Idina Menzel/Adele Dazeem flub at the 2014 Oscars, John Travolta is speaking out about his embarrassing gaffe. "I've been beating myself up all day," the Be Cool star said in a statement to Us Weekly on Tuesday, March 4. "Then I thought...What would Idina Menzel say? She'd say, 'Let it go, let it go!'" he quipped, referencing the Broadway star's performance of the song "Let It Go" from Disney's Frozen. Travolta first set off a firestorm of tweets on Sunday, March 2, when he mangled Menzel's name while introducing her at the 86th Academy Awards. "Please welcome the wickedly talented, one and only Adele Dazeem," he said. The mixup was quickly immortalized in the form of a parody Adele Dazeem account on Twitter. It also inspired the John Travolta Name Generator from Slate, which "Travoltafies" any name that's typed into it.